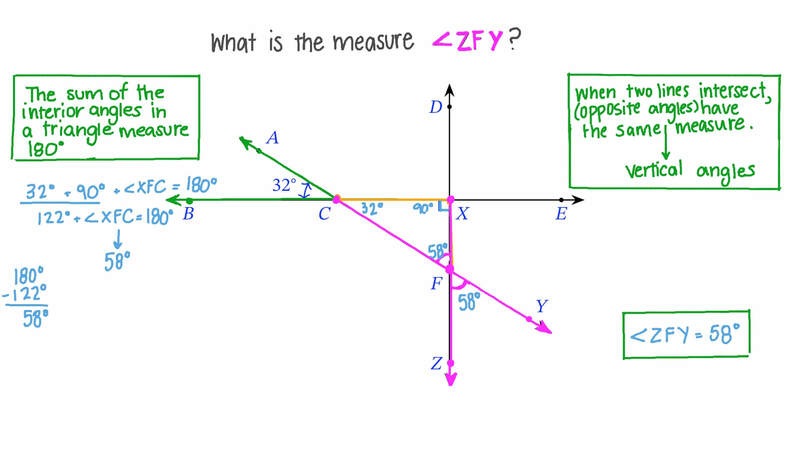 In this lesson, we will learn how to find a missing angle measure using the relations between complementary, supplementary, or vertically opposite angles. What is the measure of ∠ 𝑍 𝐹 𝑌 ? Find 𝑚 ∠ 𝐶 . Find 𝑚 ∠ 𝐴 𝑂 𝐵 , 𝑚 ∠ 𝐴 𝑂 𝐸 , and 𝑚 ∠ 𝐷 𝑂 𝐸 . Determine 𝑚 ∠ 6 and 𝑚 ∠ 7 in the given figure. Find 𝑚 ∠ 𝑋 𝐴 𝐶 . Determine 𝑚 ∠ 𝐷 𝑋 𝐶 . 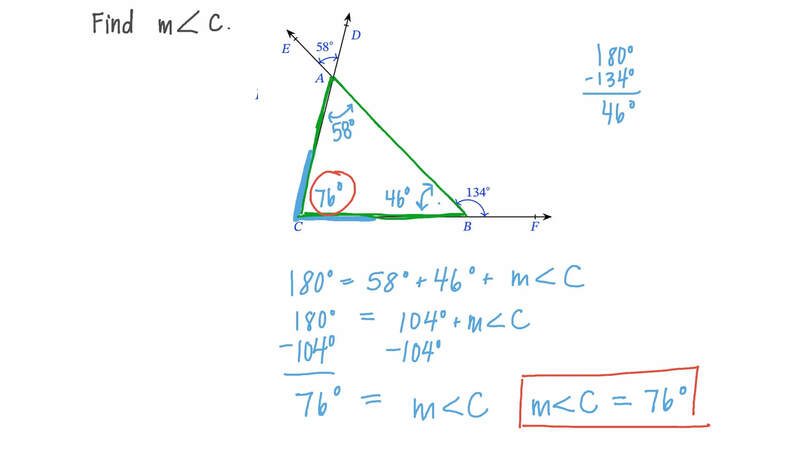 If the size of an angle’s supplement is 6 more than three times the size of its complement, what is the size of that angle? and are two intersecting straight lines. Given that and , find . If and form a linear pair, where and , determine and . These two angles are supplementary. Write and solve an equation to find . Recall that two angles are supplementary if the sum of their sizes is . The rays and are perpendicular. A point lies in the interior of . Given that and , find and . In the given diagram, 𝐴 𝐷 is a straight line, 𝑚 ∠ 𝐴 𝐵 𝐶 = ( 4 𝑥 + 1 2 ) ∘ , and 𝑚 ∠ 𝐷 𝐵 𝐶 = 1 2 8 ∘ . Using the fact that the lines in the figure intersect, find the values of 𝑥 and 𝑦 . 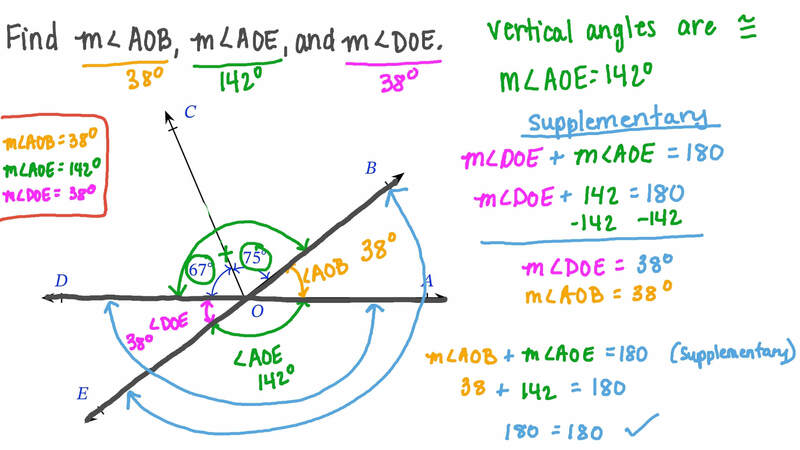 If and are supplementary, and the size of is more than the size of , find the size of each angle. Find 𝑤 and 𝑧 .